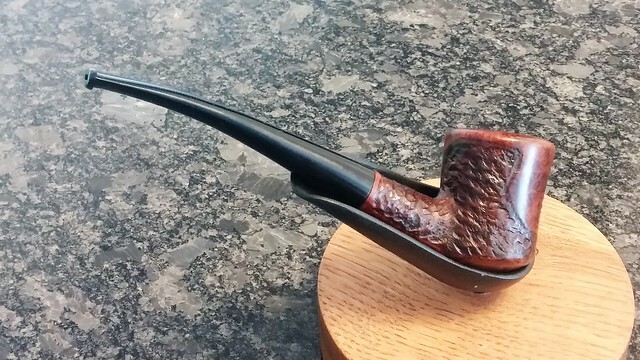 Here is another new addition to my collection of Brigham pipes – a 3-Dot Shape 82 Bent Tankard. 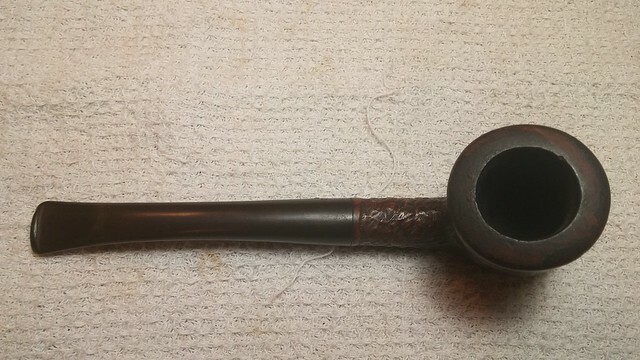 The pipe was in fine estate condition when I received it – it needed a good overall cleaning, of course, but it had been taken care of. 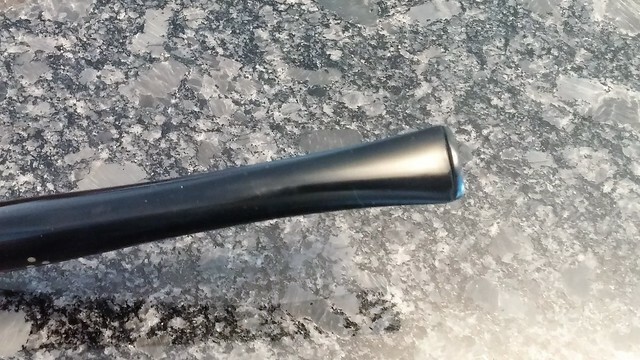 The rim was the “biggest” minor issue. 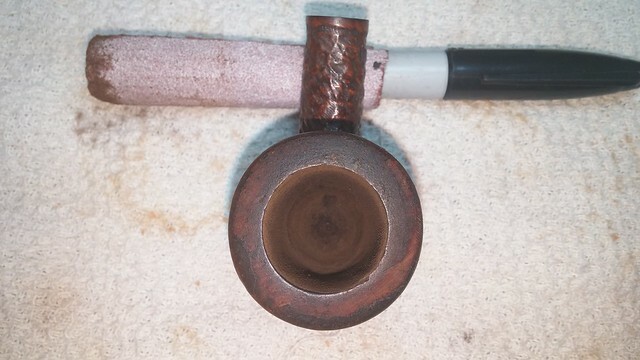 As you can see in the pics below, there was a crust of lava on more than half of the crowned rim, and a fair number if small nicks and scrapes to the inner edge from cleaning out the chamber with a knife. 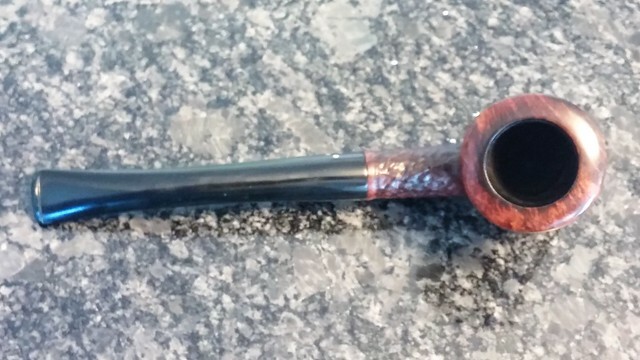 I got lucky with this pipe; it had clearly been stored away from the light, and the stem wasn’t oxidized at all. There was some light chatter near the button, but it appeared that the previous piper was not a clencher. 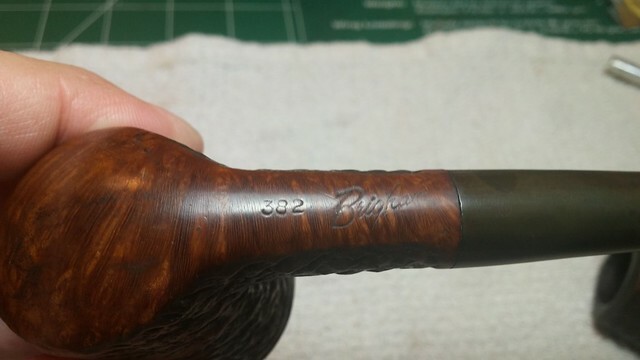 The pipe is stamped “382” then “Brigham” on the underside of the round shank. 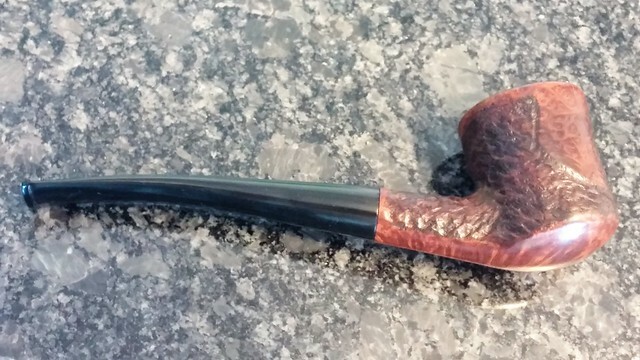 The lack of COM stamp under the Brigham logo indicates this pipe was made in the 1990’s. 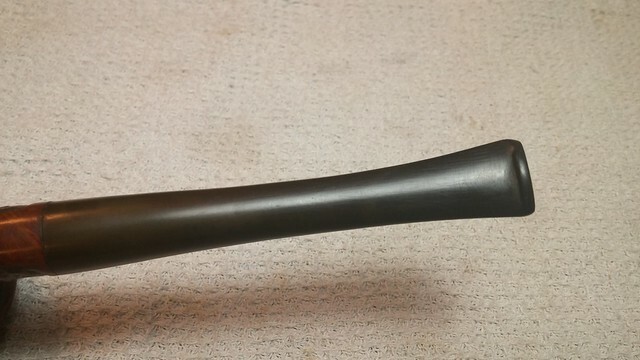 The stem is inset with three brass Dots, signifying a 300-series grade pipe. 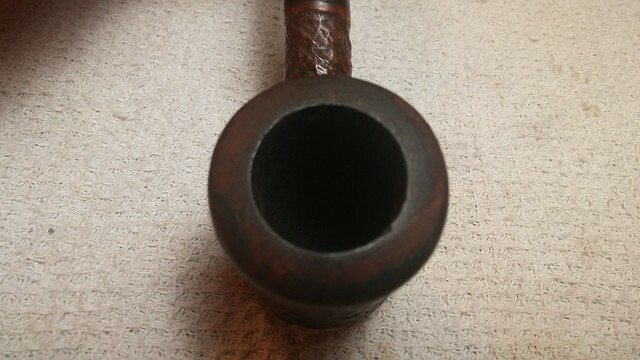 Verifying that the stem Dots match the series number on the stummel is one way to make sure that the stem is original (though exceptions exist). 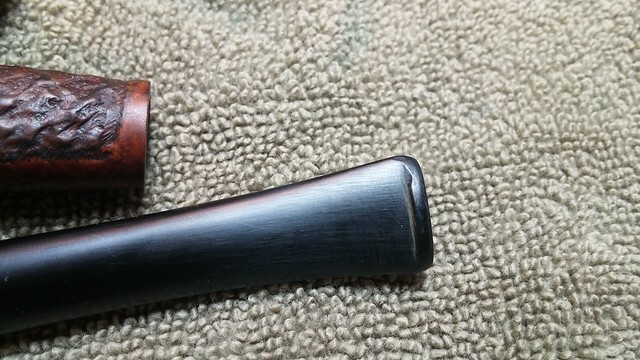 The chamber was only lightly caked, so I bypassed the reamer and cleaned the chamber out with a bit of 100-grit sandpaper wrapped around a marker. The chamber walls and floor were in great shape underneath, though you can see the beginnings of a dimple in the centre of the chamber floor – again likely from the point of a knife used to clean the bowl. While I had the stummel in hand, I attacked the rim crust with 0000 steel wool followed by a scrub with cotton swabs and good old saliva. It seems a bit yucky, but saliva is an ideal solvent for a lot of crud, including tobacco tars – and grandkids’ faces! 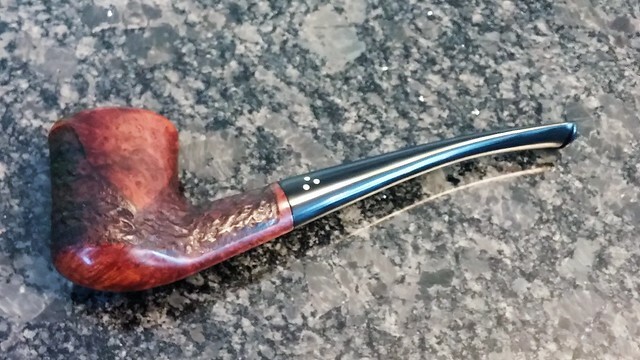 A few minutes with 320-grit sandpaper smoothed out the nicks and dents in the rim and restored the chamber’s roundness. 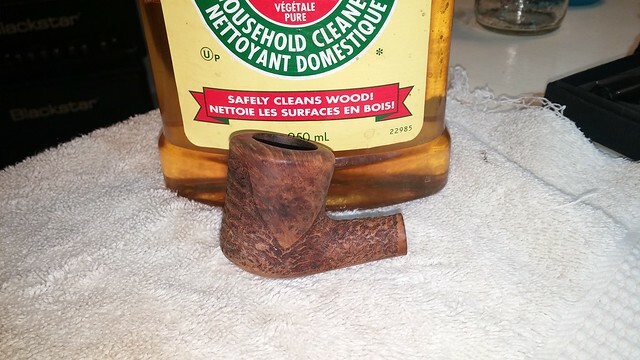 There is some nice cross-grain showing now that the everything is cleaned up. 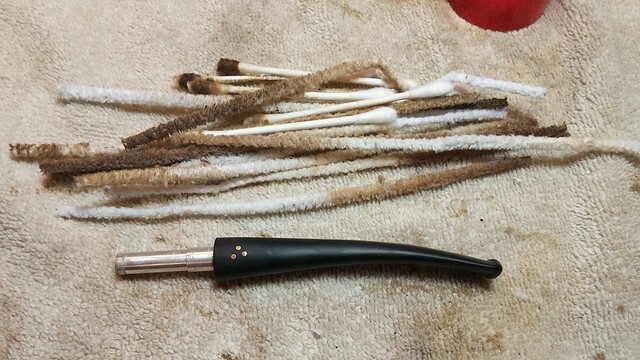 I carried on with the internal cleaning, using cotton swabs, pipe cleaners and alcohol to clear the tars and debris from the pipe’s shank and airway. 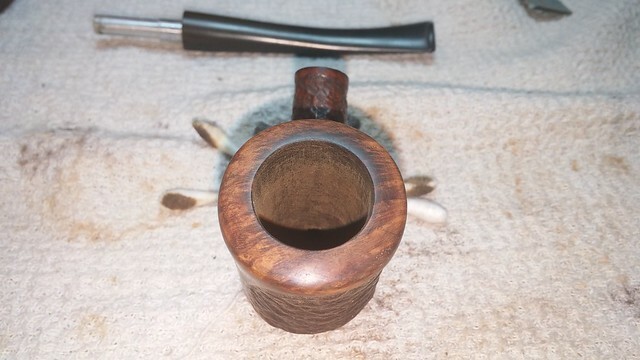 When I was happy with the shape of the stummel, I repeated the exercise on the stem. 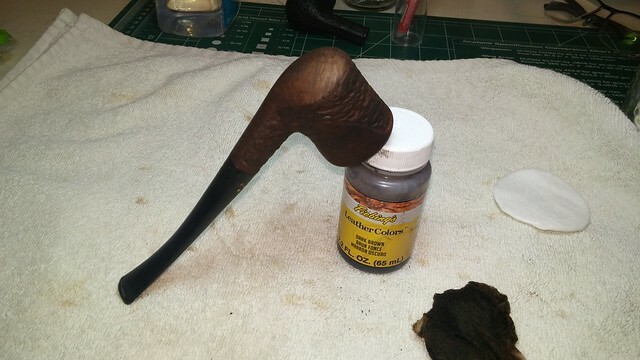 To finish things off, I scrubbed the exterior of the briar with Murphy’s Oil Soap and a toothbrush to clean the waxes, oils and dirt from the surface. 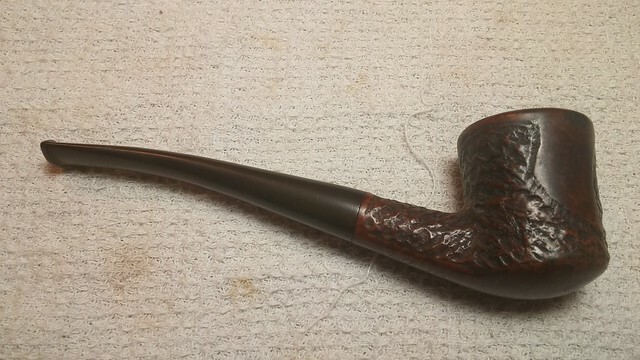 The finish was looking a bit wan, so I refreshed things with a quick coat of Fiebing’s Dark Brown leather dye. 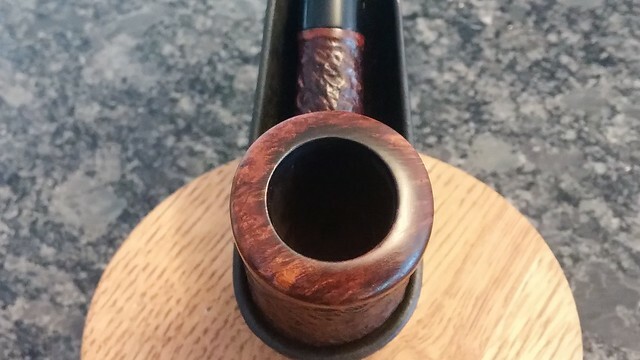 When the dye had dried, I wiped down the smooth areas of the briar to create a nice contrast between them and the rusticated portions of the stummel. 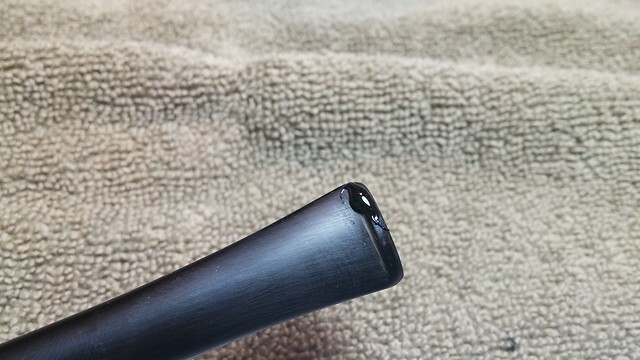 Moving back to the stem, I sanded out the tooth chatter with 320-grit paper. 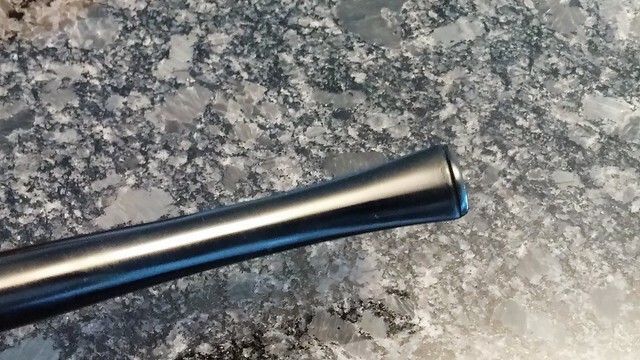 During this process, I noticed a small chip out of one edge of the button. 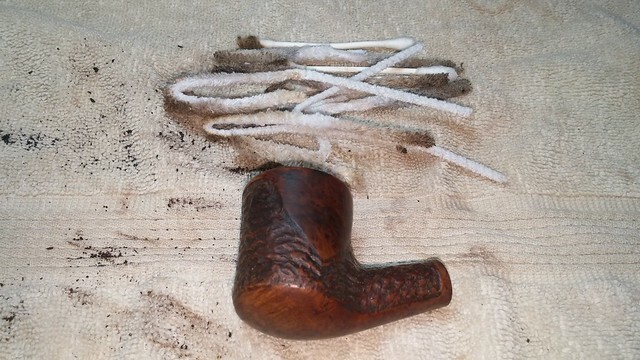 I filled the chip with CA glue mixed with activated charcoal powder, and then filed and sanded the repair after the patch had set. 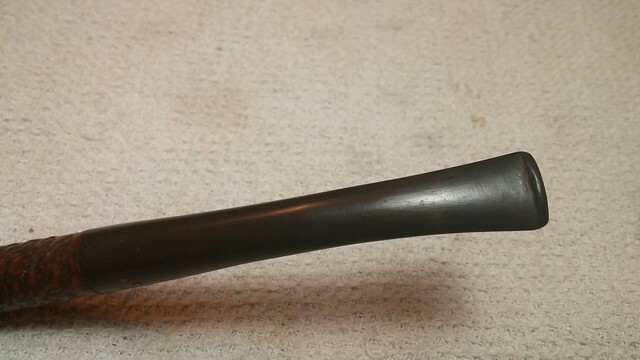 Micromesh sanding pads smoothed out my sanding scratches in the stem and prepped the vulcanite for a run on the wheel. 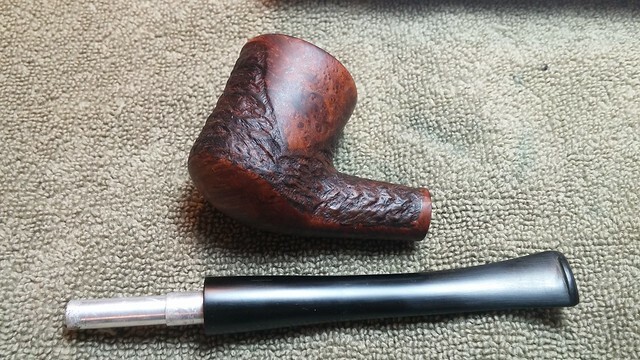 I buffed both stem and stummel with White Diamond compound followed by several coats of Carnauba wax to shine and protect the rejuvenated pipe. 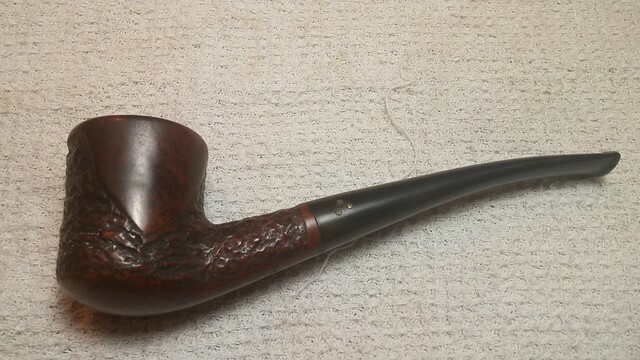 An easy refurbishment is always a nice departure from some of the more involved jobs a pipe repairman comes across regularly. 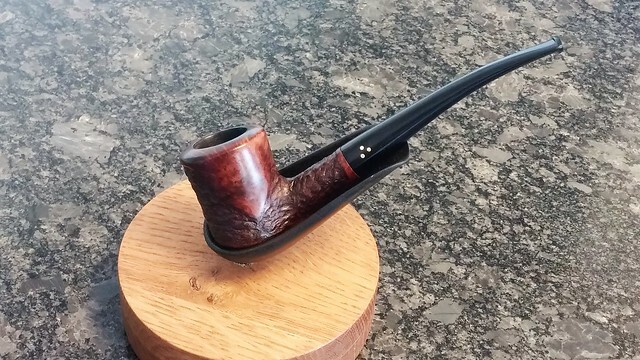 I’m quite happy with the way this Bent Tankard has come out, and even happier to add a new Brigham shape to my rack and the Brigham Shape Chart. 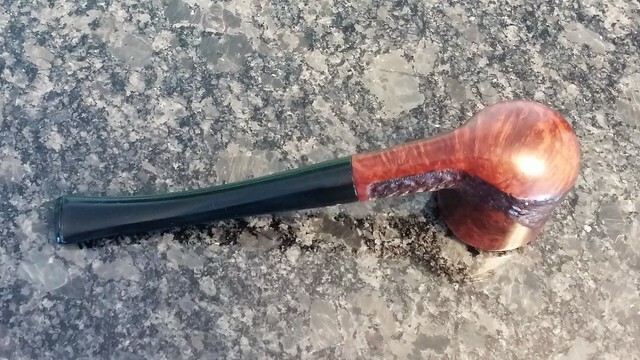 Thanks for following along on this quick tidy-up. 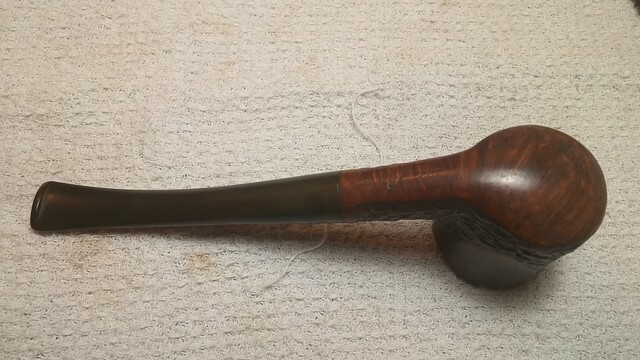 Until next time, Happy Piping!